Each of these bolded places will get its own post. 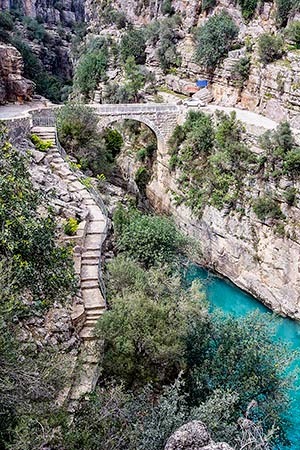 Some travel forums are very negative about visiting Antalya. 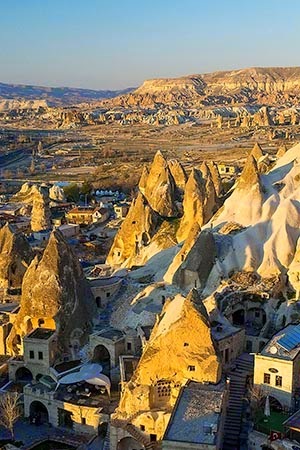 Yes it's a large city but so are Istanbul and Bursa. 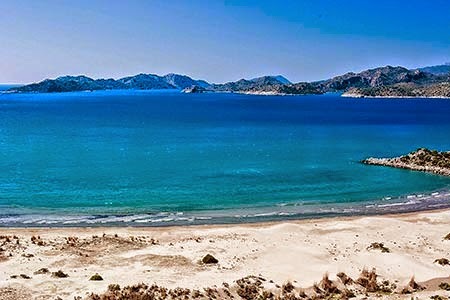 If your goal is to mainly spend time on a beach then for sure stay at smaller towns discussed in pervious posts, like Dalyan, Demre, and Kaş. 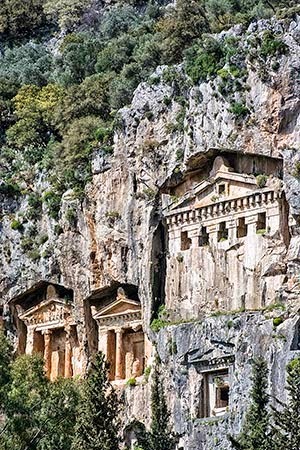 As we are driving in from the west side, we made an executive decision to go straight to the Antalya Archaeological Museum rather than our hotel in the old city, Kaleiçi. There was ample parking and we spent at least two hours there. If you dig archaeology you could easily spend more time. 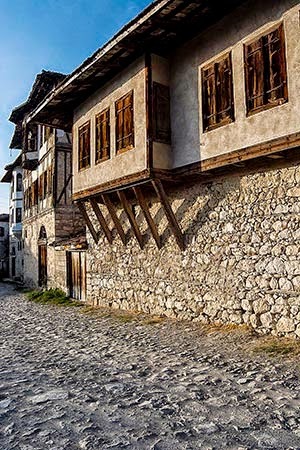 The museum is located at the curve in Konyaalti Caddesi that heads to/from Kaleiçi. 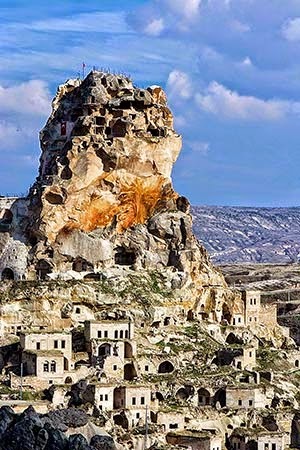 The reason for the wealth of objects in Turkey is that Istanbul and Ephesus served as the terminus of the Silk Trade Routes. There was not a single Silk Road, a term invented by German geographer Ferdinand von Richthofen in the 19th century. There were many routes, including some sea routes (see the Silk Routes Map). There is another misconception to clear up. While we know many inventions, art, silk, paper, gunpowder and other goods came from the East; there were many inventions and goods from the West that went to Asia. 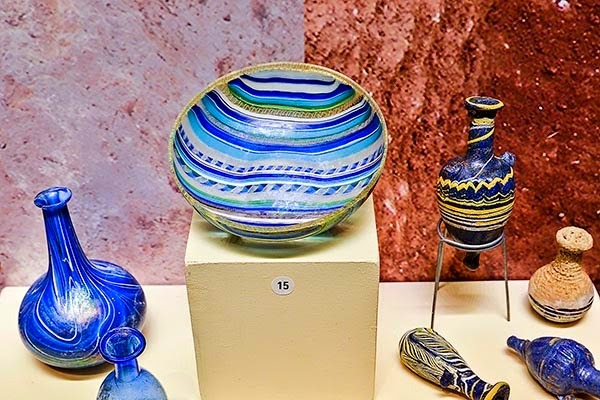 In the hall of small objects look at the amazing glass with ornate colour patterns. Glass is one of these inventions. 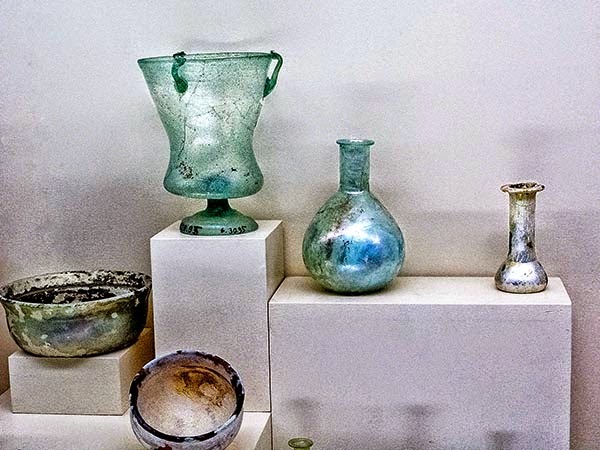 It is associated to Ancient Rome but the first true glass was invented in what is now Syria. Cotton, cosmetics, chairs, peaches and grapes are some of the western exports. The museum is very well laid out with lots of space between artefacts. I loved the Romanesque niches that were used to highlight each statue. This also gives a feel for the way these statues would have been displayed in Ancient Roman times. The lighting was either very atmospheric or purposely too dark for good photography. Their policy of no flash is ridiculous as I seriously question whether flash can affect stone. Let's get real. The more likely reason is to prevent photographers from getting good photos rather than buying the museums' books. After learning how to let my new digital camera adjust the ISO sensitivity (formerly film speed) automatically, I was able to capture photos without the use of a tripod. However the photos may be grainy. 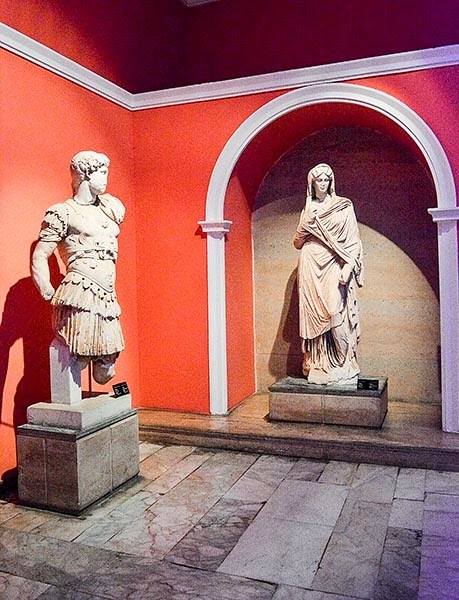 Some of the best photographic subjects are the Ancient Roman sculptures. 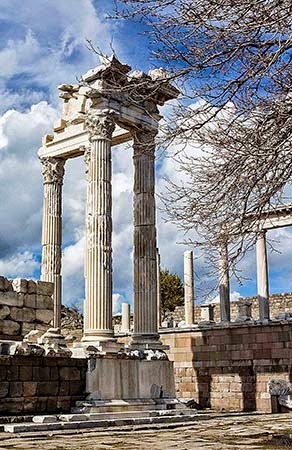 The main hall to visit is filled with statues of gods excavated from nearby Perge, 11 km east of Antalya. The next in importance is the hall of Emperors and their wives. 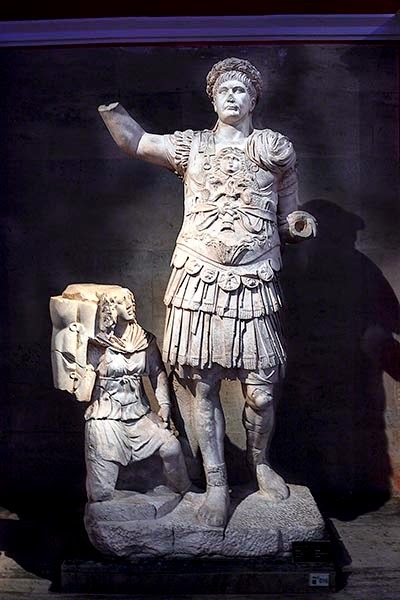 As you look upon an ageing Trajan dressed in military cuirass, remember that he was the one who fought many wars to expand Rome to its greatest territory. 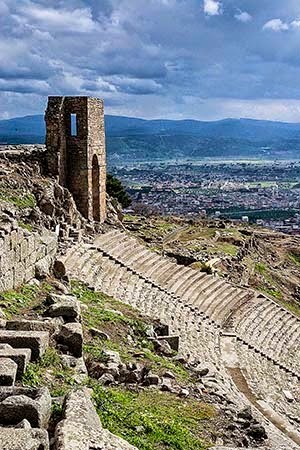 Also remember he was responsible for starting the Temple of Trajan in Pergamon (discussed in an earlier post), which was finished by his successor, Hadrian. 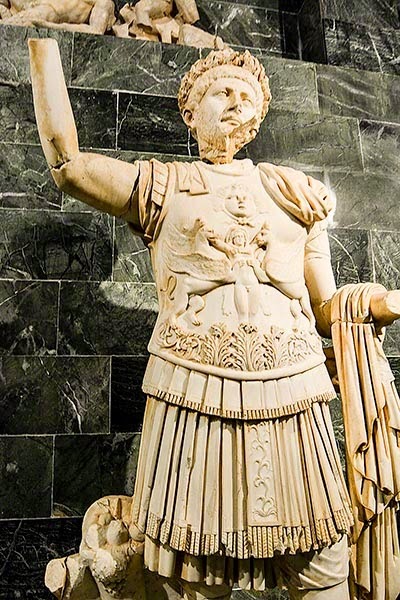 Admire the statue of Hadrian from the North Nymphaeum at Perge. Hadrian stopped expanding the Roman Empire as he preferred to promote the arts and architecture. As you take in his portrait, remember that he was also an architect and sponsored the construction of the greatest building and dome of ancient history – the Pantheon. A side trip upstairs brings you to the numismatics section. 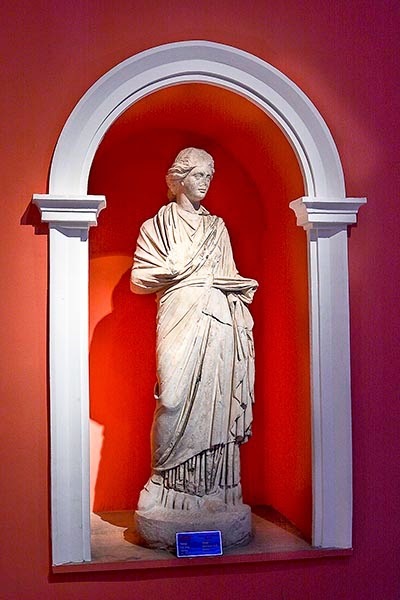 Lydia (located just north of Lycia) invented the first coins in the world. 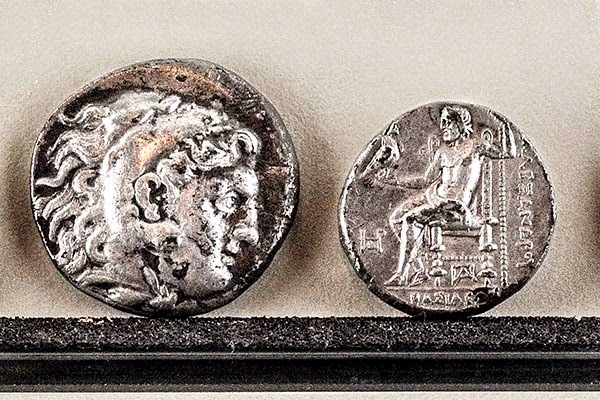 Alexander the Great spread the idea around the world while promoting his image on the "heads" side. Some things have not changed. Royalty or presidents still adorn the "heads" side. Coming back to the ground floor, is probably the best statue in the museum – especially because it used to be in two pieces. 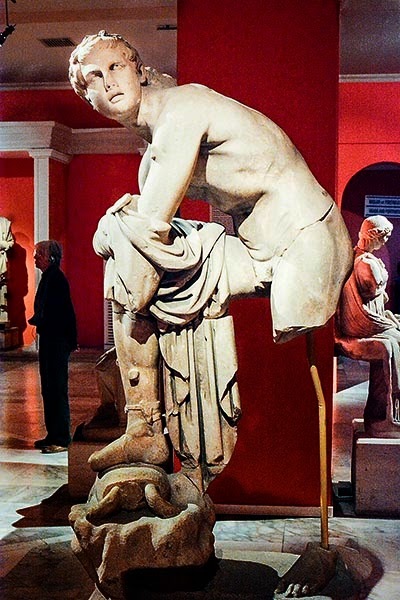 The “Weary Herakles” is a Roman marble statue that was excavated in 1980 in Perge, Turkey. However, the top half was removed during excavations and sold to the Museum of Fine Arts in Boston. 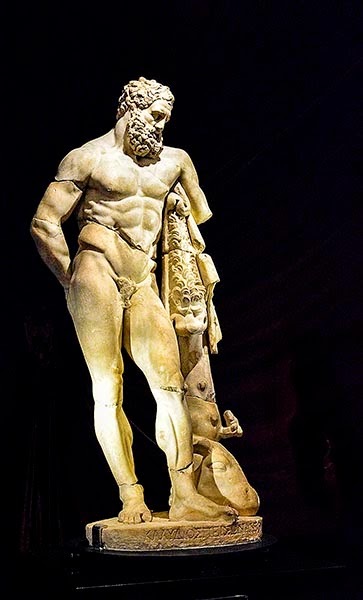 After much negotiation, Hercules finally returned to Turkey in 2011 and the top portion was reattached to the torso. Herakles or Hercules was the god of heroes, sports, athletes, health, fertility, and divine protector of mankind. One look at this statue and you know he was a paragon of masculinity, strength, and sexual prowess. Heracles used his wits on several occasions when his strength did not suffice. The skin of the conquered Nemean Lion is shown draped on his left side. This was a mythological lion with golden fur that was impervious to attack and claws that could cut through any armour. It could not be killed with human weapons. The lion was strangled to death by Heracles. I love the chiaroscuro lighting with Heracles appearing out of the dark shadows in a corner niche. It is truly the piece de resistance of the museum, which really has a knack for presentation and lighting. Next came a hall filled with Sarcophagi, lots and lots of them. Normally, this where your brain shuts down because you don't know what to look for or appreciate. It's also so much easier to get "museumed out" when you're hungry – we still hadn't had lunch. Sometimes our days feel like we are on a guided tour but without the meals and we have to do the driving. We did notice the sculptured bas reliefs along the sides of the coffins. 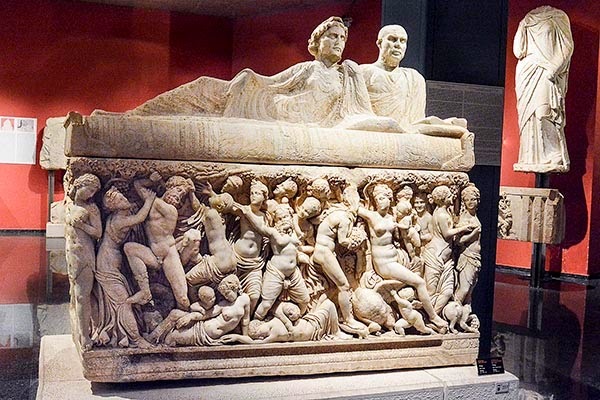 However one huge coffin was a work of art, the Sarcophagus of Aurelia Botain Demetria, from 2nd Century Perge. Soon after several art students sat down and drew pictures of it. So we had made a good choice. As we completed the tour, we were impressed by the clothing and artefacts in the ethnography hall. 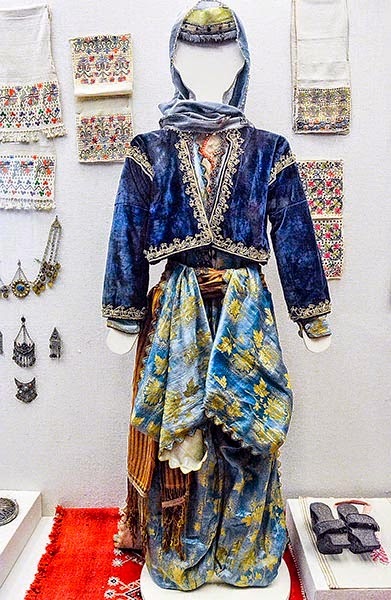 What gorgeous blue dyes were used in the clothing. It's hard to believe that the outfits are in such good condition.